Featuring Tanzania Red Spinel Jewelry at I Got Your Silver Lining (IGYSL) Fine Jewelry. Excellent quality, color and clarity gemstones at promotional wholesale pricing for a limited time. Don't miss your chance to own a beautiful piece of jewelry that's almost an excellent investment. Rather you buy from IGYSL or someone else, we strongly recommend that you invest in Tanzania Spinel. It's double digit growth rates are expected to continue on the same rate and pace. All IGYSL clients are assigned with own personal shopping concierge and yours will be glad to provide an additional investment reports on spinel as well as our other investment grade gems. Tanzania Spinel is one of the most valuable of the Spinels. In fact, even though Spinel is not new to the scene, the Tanzania material has put Spinel as an overall gemstone on the industry map. As a result, Tanzania Spinels are sky rocking in price and market demand. 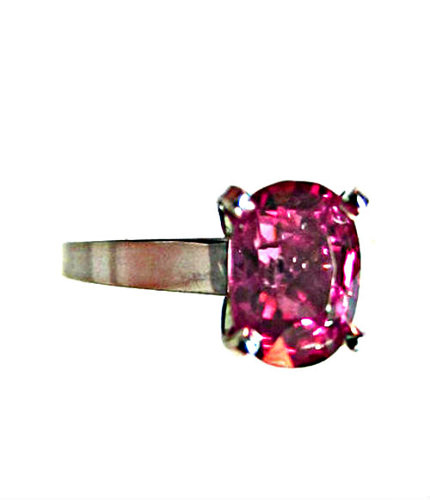 Here is a rare 'Pinkish Red Tanzania Spinel (1 ct, Oval Cut) Ring' set in 14k White Gold in a sizeable 7. Spinel is 100% natural, straight from Mother Earth is zero color enhancements. The rough is only cut and polished. This particular gem has excellent pinkish red hues, saturation and tone levels along with Eye Clean (EC) clarity. EC is higher o nthe colored gemstone grading scale than VVS, which most clients identify with based on their diamond grading knowledge base. This is a terrific opportunity for one special person. Take advantage of IGYSL's promotional wholesale pricing. We have 5000+ inventory pieces and we must make room for the recent holiday buys. We have taken this ring all the way down to $399! Who gets rare Tanzania Red Spinel set in solid 14KT White Gold at these price points? We must make room for an upcoming buying trip and clear out inventory before the end of the quarter. I buy a lot of jewelry from all over the world, and there are many very fine sources out there for sure. But every once in a while, you come across a supplier who combines the very BEST of merchandise with the VERY BEST OF SERVICE AND FRIENDLY COLLABORATION! The folks at IGYSL are just that "RARE SUPPLIER", and rate among the BEST SUPPLIERS OF FINE JEWELRY IN THE WORLD, in my opinion. I just completed yet another (in a long line) of SUPER BUYS from IGYSL recently and it was a 3+ Carat Pinkish Red Spinel Solitaire in 14k White Gold. Not only waa the SPINEL a AAA+ stone, but the deal I got was unbelievable! And the service there (in the person of my own "concierge" Lisa was 5 STAR as well! Click the button below to add the Pinkish Red Tanzania Spinel to your wish list.